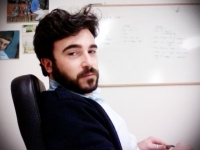 Alessandro Di Maio, Italian-Australian Media Maker and Political-Security Analyst on EU, MENA and Mediterranean Affairs. Born in Sicily. Grew up between Sicily, Australia and the Middle East. Now living in Bruxelles. Interested in geopolitics, strategy, defense, security, EU, MENA, counter-terrorism, journalism, photography, human rights, cultural studies, religious studies, archeology and history. 2009, Rome - "Progetto Bonelli Press Office Media Award"